Home Technology Compactus Mobile Shelving: Is It Important? The mobile shelving market is booming again, after nearly three decades of disuse. Which begs the question: Why? Mobile shelving units, like compactus, saw their heyday in the paper laden years during the dawn of the 20th century. Ideal for storing large amounts of documents in an orderly and easy to access fashion, these units were perfect for the sans-digital record generation. But by the time digital filing had rolled around, compactus units were relegated to the forgotten corners of ancient libraries and dark medical record banks, left to be forgotten. Until now. Marketers and purveyors of the roving relics say that they’re coming back in a big way. Mark Stevenson, a spokesperson for Premier Lockers out of Australia tells us that sales for these units have soared in the last few years. Revealing that, compactus units have once again found their place in the business sector, even though anyone has much need for large paper filing systems. So how exactly are they being used? What Is a Compactus Unit? 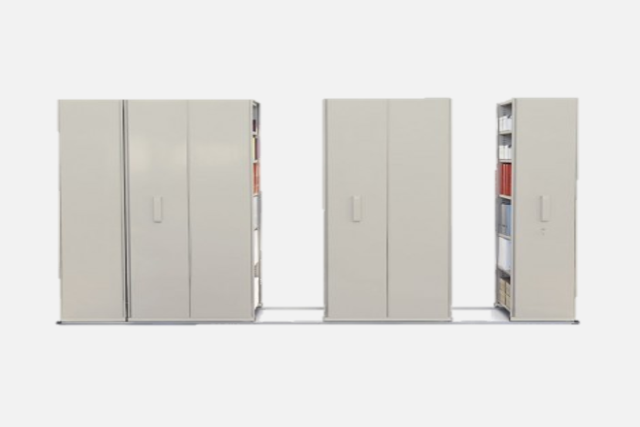 Compactus units are a type of storage system that essentially looks like multiple bookcases on wheels. The “bookcases” are called bays. Wheels are integrated into a track system, facilitating easy movement and keeping the bays stable. These units are then closely packed to create a large block of individual storage bays that can then concertina out as a person needs to access any particular unit. Creating an “as needed” aisle between the bays. “The technology that these units now have integrated into their systems is what really sets them apart from other filing systems.” Stevenson says. “[Compactus units] also can free up about 50% of available floor space over other types of storage systems.” Making them a hot commodity for small startups that have to use every available inch of floor space wisely. “These systems are ideal for storing just about anything. They’re not just for files and paper” Stevenson reminds us. He says that the units are spectacular at reducing injury when it comes to organizing heavy stock. “We’ve found that most libraries are particularly keen to have compactus systems integrated. The systems can handle 50-100kg on each shelf, and the track and wheel system make moving those heavy bays really easy” Systems like this can help access to disabled communities, as they don’t require a huge amount of strength to move about. Built in motors and safety mechanisms help reduce strain and injury when dealing with the heavy bays. Tracks are low profile, so they won’t impede traffic from wheelchairs or walkers. Making the stowed materials easily accessible to any part of the population. Newer units can also come fully digitized, using mechanical panels or RFID scanners to open aisles, locate specific goods, or lock the units. “We find that the locking panels are generally purchased by firms that have sensitive documents or priceless goods that need to be safely and securely stored.” Stevenson says that besides libraries, they also do business with museums, law firms, medical clinics, and many other types of establishments that require their goods to be kept under lock and key. “Once a unit is locked, it’s extremely difficult to access without a key code.” He says. Due to the rising cost of property, especially in cities, where most businesses need to be to thrive, compactus systems can be a godsend. For any enterprise that has a large amount of stock, and not much place to put it, compactus can easily solve the organizational and aesthetic headaches that many small businesses come up against. “These units can store anything” he chuckles at the implication. “Okay, maybe not an anything. They’re definitely not ideal for live animals.” But priceless pieces of art and sculpture? Check. Books and IT equipment? Check. Even bulk items, from hardware to dry goods. You can also get compactus systems that are built to order, should you need to store things that aren’t ideal for shelves. Some masterful builders have even fashioned entire individual offices spaces out of mobile shelving units. Tucking away the employee’s lounge, complete with water cooler, fridge and sink, to open up the conference section- that houses projectors, televisions, and large pop out tables. We’ve even found articles describing entire homes built in a compactus state of mind. Proving that there is absolutely a reason this functional storage system is back in vogue. As it seems, no matter what it is you need to store, organize, or hide from view, compactus has you covered.